Beautiful Incentives: Unique gifts for the whole family from Bullet Designs! Unique gifts for the whole family from Bullet Designs! Bullet designs was the inspiration for this post. I received product for evaluation. All opinions are my own. I am always looking for the next unique accessory to help emanate my personality. Among my favorite type of pieces has to be the recycled beauties I come across. I have only ever reviewed one other type of jewelry, made of disabled weapons, and recently discovered another company called Bullet Designs. They create gorgeous jewelry out of only bullets of every kind you can think of. This has to be newest favorite jewelry company. They incorporate so many different themes into their pieces that there's something to fit everyone's fancy. 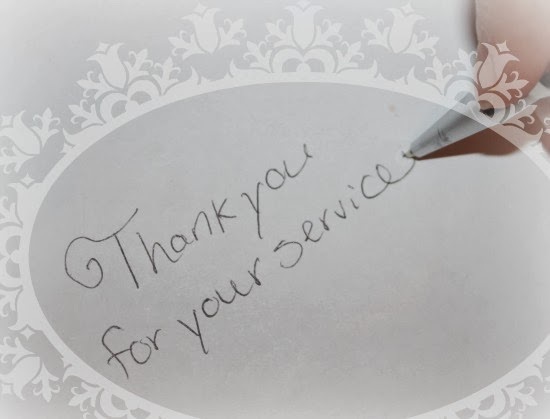 Do you have a spouse or family memory in the Navy? Do you have someone who may have served and passed? 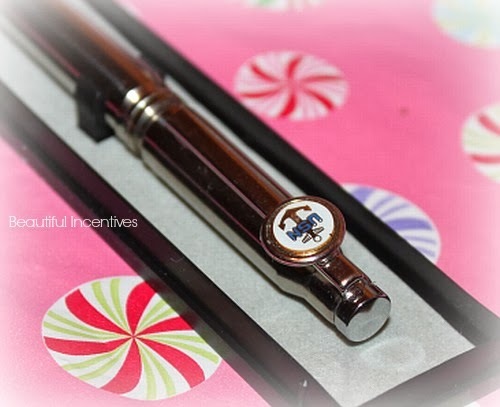 I do and I thought this pen was the perfect way to keep him in my memory as the brave Naval Academy Loutenant my brother was. This US NAVY pen is beautifully made of Nickel silver and very good quality. It is heavy but not too heavy, comfortable to handle and writes perfectly. This pen is refillable and works by twisting. It comes in Black Ink with a Pen box included. Size 5 1/2". Available in Brass (shown below) or Nickel. Made with Recycled (Fired) Casings and/or Bullets. 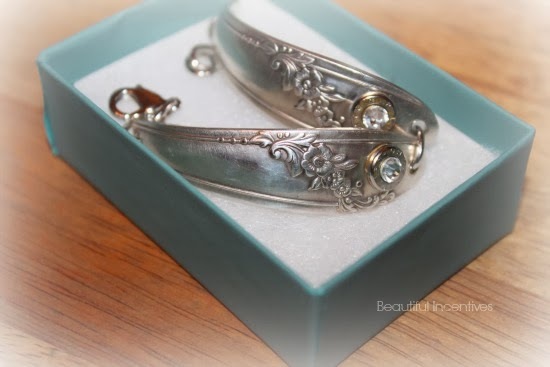 Just as Beautiful is my favorite piece of theirs, the vintage spoon bullet bracelet. Crafted with a beautiful ornate design. 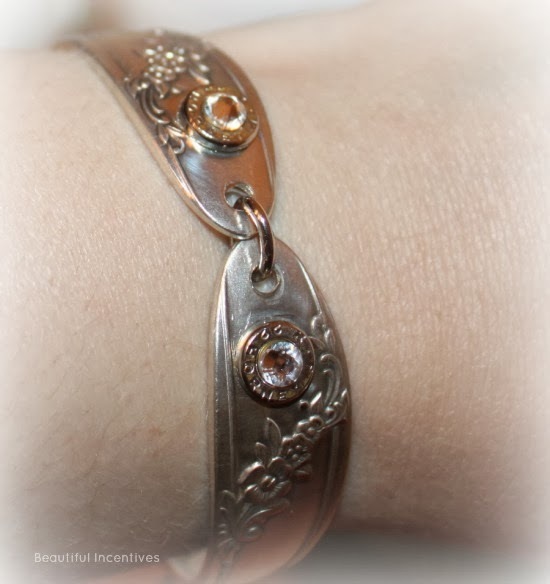 This bracelet is made from recycled antiqued silver plated spoons, two authentic fired bullets, and swarovski crystals. It will adjust up to approximately 8". It is 5/8" at the widest part of the spoon. The twinkle from this is so bright. Really, the pictures do it no justice! I absolutely love both these pieces and use them frequently. I can attest to the quality as nothing has fallen apart on me. If you are looking for a unique gift this is definitely where you will find what you need! They have everything from earrings to zipper pulls and party lights! A must see! 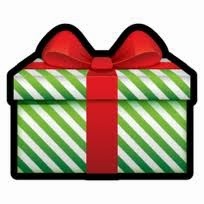 This company is definitely Gift Guide Approved and recommended for Stocking stuffers, Valentines Day and Birthdays. Stay tuned for more beautiful accessories from Bullet Designs in the coming months. I have a great Valentines Day feature! To find out more, follow their social media and keep up with promotions!